It is official! 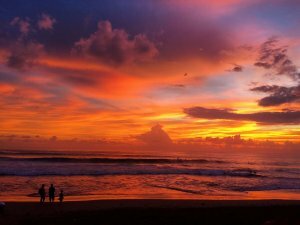 We are in love with Berawa beach (Canggu) on its good and bad days. Berawa beach is the perfect beach for intermediate surfers. Not too easy, not too difficult, just perfect. Though (as with all breaks in Bali) it can get crowded, for some reason, it never feels too crowded. The beach is a semi reef break and works well from 3 feet and up to 7-8 feet. It is quite spread out and there are different picks to choose from. The wave is mainly right but there are some left ones as well. On a big swell day, the right corner towards Berawa bombi tends to get bigger so staying on the far left seems wiser. It really depends on the swell of the day, but normally Berawa works on low or low to mid tide. If the tide is too high, there is a nice shore break that seems much harder than it actually is. And if you actually want to get your first small barrel, Berawa shore break is the perfect time to try it out…Or if you are brave enough, just go on the far right on a big swell day and get ready for some serious barrels! Apart from the beach itself, I also like the people surfing here. Maybe it is just because I go there way too often, but they seem to be the friendliest crew I have seen in Bali, not too competitive and quite relaxed. 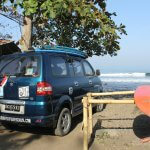 Berawa is good for surfing but also for hanging out. 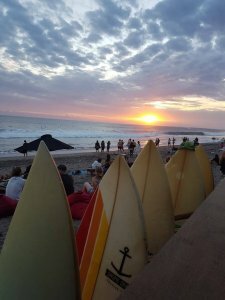 Though lately it has got a bit noisier with the recent opening of Finns bar, sitting at the beach at sunset remains a must!